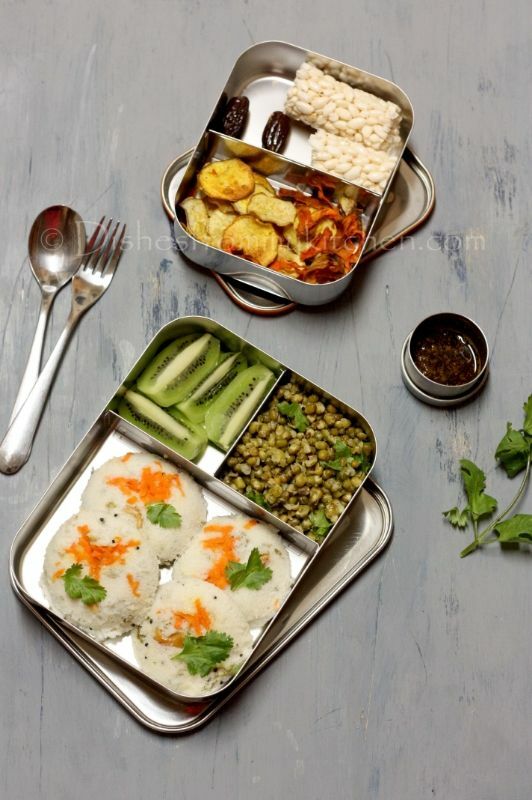 Dishesfrommykitchen: KIDS LUNCH BOX - STUFFED MASALA IDLI WITH POTATO FILLING, SEASONED GREEN GRAM ! 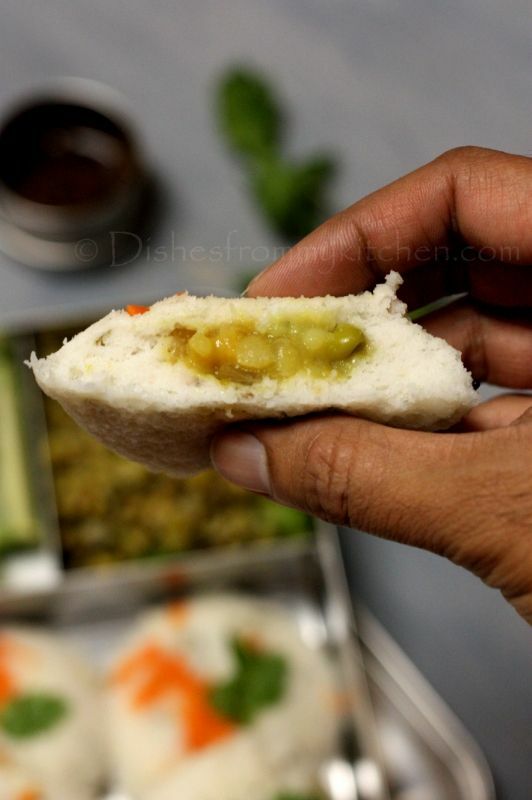 KIDS LUNCH BOX - STUFFED MASALA IDLI WITH POTATO FILLING, SEASONED GREEN GRAM ! 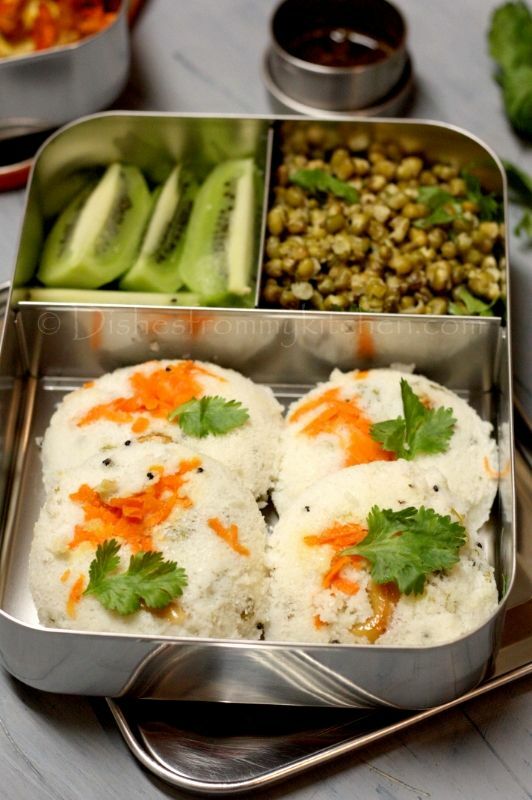 LUNCH BOX : STUFFED MASALA IDLI WITH POTATO FILLING, SEASONED GREEN GRAM , KIWI ! 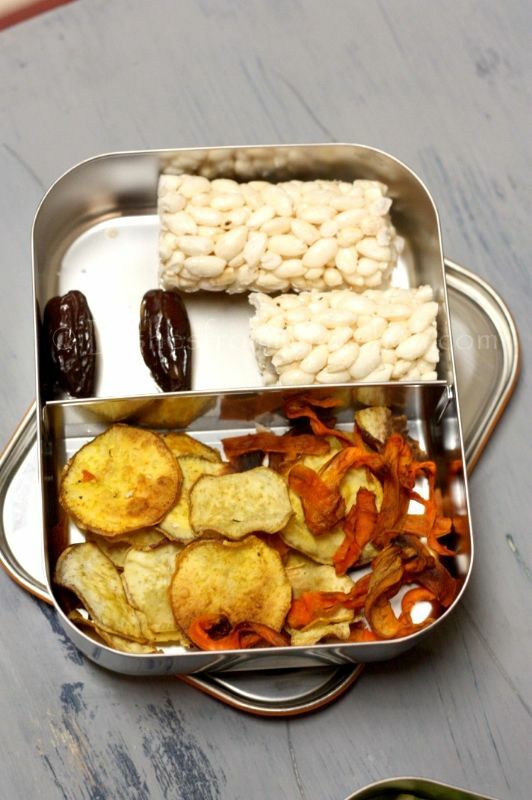 SNACK BOX : PUFFED SWEET RICE ROLLS , DATES AND BAKED VEGETABLE CHIPS ! This is one variation of masala I do for making Potato masala stuffed idli. Will try to post another variation soon. 1. Boil potato, remove the skin, roughly mash and keep it aside. add curry leaves, onions and frozen peas. 3. Add Ginger and green chilli paste. 4. Now add turmeric, mashed potato, and salt. 5. Mix everything well until they are combined well. 6. Add chopped cilantro and lemon juice. 7. Keep it aside let this cool completely. 1. Heat oil in a pan, splutter mustard seeds, add ginger and chilli paste slightly sauté, and add chopped curry leaves. 2. Add the mustard seeds mixture to idli batter along with cilantro. Give it a mix and keep it aside. 1. Grease the Idli Plates, keep the grated carrots and a cashewnut in the center of the each cavity. 2. Pour 1 to 1 1/2 tbsp of batter idli batter above the carrot, keep 3/4 tbsp of potato masala in the middle of the batter. 3. Now again pour couple of tbsp idli batter as usual above the masala stuffing. 4. Steam the Idles for 10 to 12 minutes. 5. Give 2 to 3 minutes of standing time. Then remove the Idli from the plates the way you usually do. Serve hot with your Favorite chutneys or Podi's (Spice powder). 1. Soak Mung bean overnight. Pressure cook or cook in a pot boiling water with adding salt. 6. Add cooked Green gram, add lemon juice and salt. 2. Shave the carrots lengthwise into thin strips using a vegetable peeler. Place the carrot strips in a medium bowl, add the oil, salt, and pepper to taste and toss with your hands until thoroughly coated. 3. Place the strips in a single layer on 2 baking sheets do not overlap. 4. Bake for 6 minutes, then rotate the pans between the racks. 5. Bake until the edges of the chips are just starting to turn golden brown, about 6 to 8 minutes more. 6. Place the baking sheets on wire racks and let the chips cool completely until crisp. Store in an airtight container it stays good for a week. 1.Heat the oven to 375°F. 2. Slice the sweet potato into very thin rounds(I used slicer). Place them in a bowl, add the oil, chilli powder, rosemary, salt and toss with your hands until they are well coated. 3. Place the slices in a single layer on 2 baking sheets—the rounds can be touching without overlapping. 4.Bake until the edges of the chips centers are just golden brown, and the tops are dry to the touch, about 12 to 14 minutes flipping halfway through. 5. Place the baking sheet on a wire rack and let the chips cool completely. 6. Store them in the air tight container. It stays good for a week. Hi! Where did you buy these boxes? They are perfect! Very nice recipes. The lunch boxes are also very nice. Where did you buy them ? BEST EVER BAKED PUMPKIN DOUGHNUT ! ROSEMARY RAISIN PECAN CRISPS / CRACKERS !